Instant jungle gym. 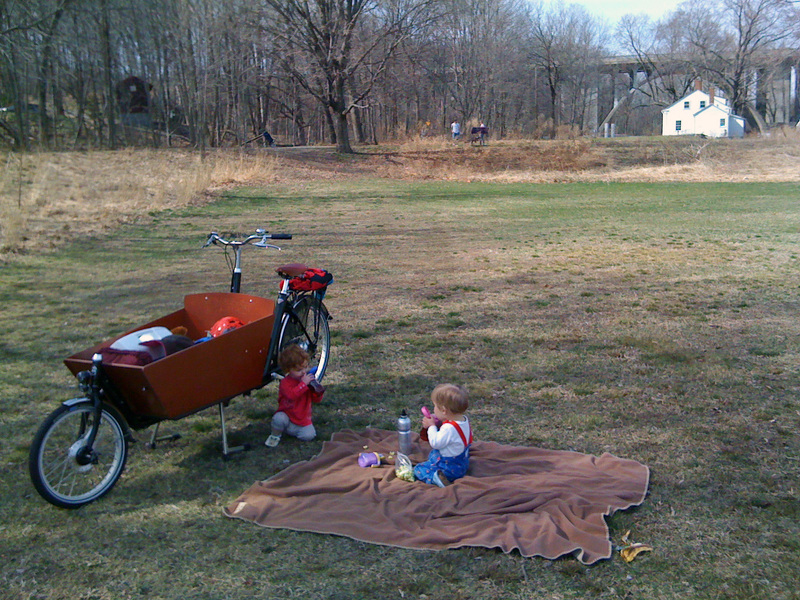 Just add bakfiets. We took a ride to the river path a few weekends back. The path starts five miles from here. In previous years, before kids, we’d taken a direct route, most of which was along a road with a 45mph stretch. This year we wound through the neighboring downtown along quiet residential and mostly empty industrial roads. The bike is a huge novelty. People love to stop and talk about it, wave, whatever. Even the meatheads who would normally gun it will smile when they pass. 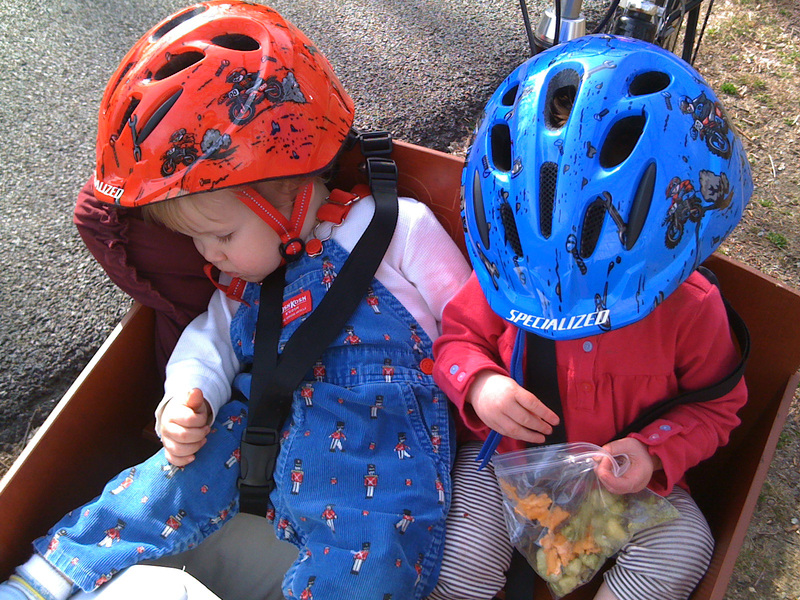 I have maybe stumbled on to the solution to road rage because apparently twin toddlers + crazy bike = ♥. I like talking about it (clearly, or I wouldn’t be writing) and anything that sparks someone’s interest in being practical on a bike I think is a good thing. We get a ton of questions, of course. What dd it cost, where did it come from? Did you make it? It’s electric, right? Did Harris build it for you? Someone recognized it from The Amazing Race. Somebody else recognized it from the Internet. One woman knew what it was and raved about her friend’s Christiania. The guy says, “No it can’t. No. It can’t. A car has an engine,” very sternly, as though it were 1950 and I’d just told him we would put a man on the moon. And also as though I were a child. 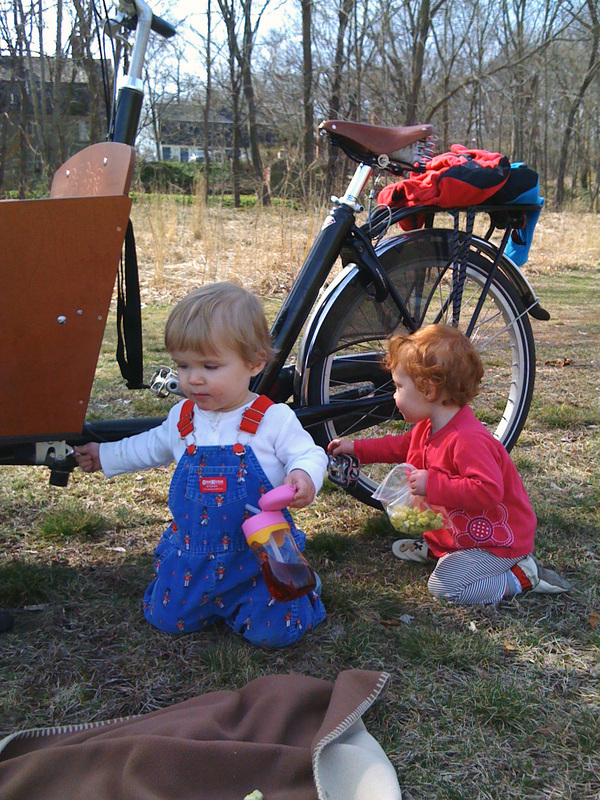 We set up on the grass by the museum and the kids stuck to the bike. They’re fifteen months old, so anywhere they can stick their hands they will stick their hands. 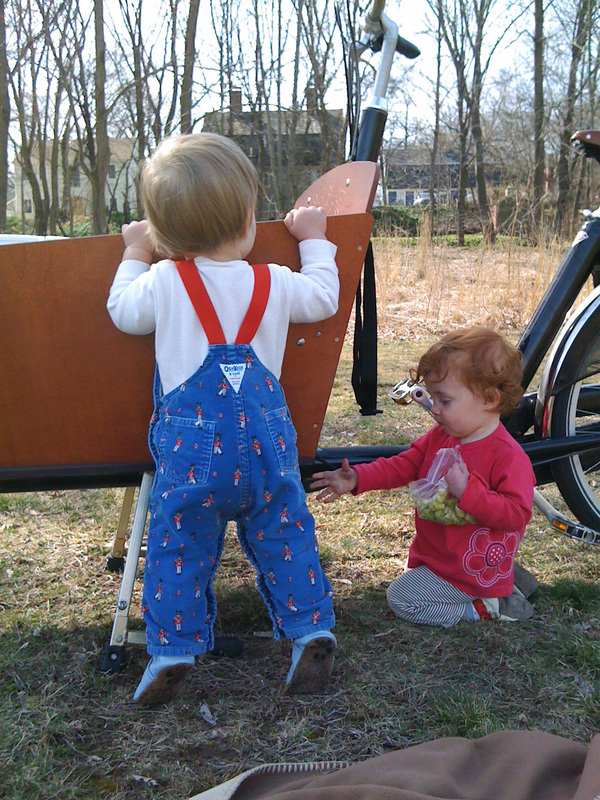 The bike has a lot to poke and climb on, the pedals spin. The latch for the stand is a big hit. An unexpected benefit to the mechanicals being enclosed, too, is there really are no bad spots for them to grab. No greasy chain, no sprocket teeth, no derailleur springs. I didn’t have to hover. On our way back, we followed a couple who looked to be recently retired. They came to the end of the path, coasted out into the dead-end street, made a slow U-turn and headed back the way they came. We didn’t see anyone leave on a bike. That’s what keeps it from being a useful path. A good path brings you right into the center of town where the shops and restaurants are, so that you can have had a real destination, instead of the path being the destination itself. Even in the heart of this faded mill town there are places to go. On this trip, too, I learned that slower is better. My knees are thanking me.